As we all know about the recent partnership between VMware and Amazon which brings us with VMware Cloud on AWS, there has been a lot of talks, various blogs / references, webinars which has been made official discussing about how we can run the complete Software Define Data Center stack as a Cloud Service on AWS. I was able to gather important information from various sources so thought of bringing it down to 10 Important points that we need to know, these points would be worth noticing for those who are already maintaining and planning to expand their on-premises infrastructure, if you are looking for your data center consolidation and migration and also those end users who are looking for different environment (DEV, TEST, LAB) etc. 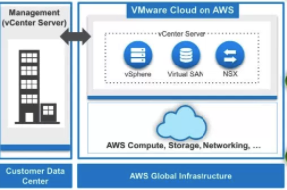 VMware Cloud on AWS provides complete Software Defined Data Center Stack delivered as service running on AWS which includes (Compute) vSphere, (Storage) vSAN and (Networking) NSX with direct access to vCenter Server. vCenter Server will act as primary center for all the operations so tools that we are currently using in our on-premises environment will work in VMware Cloud on AWS, with an additional skill set for the admins as now they would also be dealing with Amazon Web Services. It’s not a nested environment the VMware Cloud on AWS would be running on Bare Metal AWS Infra deployed as private cloud with ESXi hosts, vSAN (ALL FLASH) and NSX solely manage by VMware including installation, maintenance and upgrades. As far as the deployment options are concerned VMware Cloud on AWS will be available with different deployment options to choose from including Stand Alone Installation, Hybrid Cloud Installation and Cloud to cloud deployments wherein NSX will play an important role here in both Hybrid and Cloud to Cloud deployment to provide networking related services with vCenter running in enhanced linked mode. There would be two Virtual Private Cloud that would be linked together first one is running with our own VPC and the second VPC solely manage by VMware which will have two pools i.e Management Pool (vCenter, PSC, NSX Manager) and Compute Pools (NSX Logical Switch For Workload VM’s). For each VPC there would be separate account in AWS i.e VMware Cloud VPC Account which would be a new solution account created and completely owned by VMware for each customer, and the AWS Customer VPC account which would be owned and paid directly by end user with full access to AWS services catalog and VMware Cloud Endpoints within VPC. 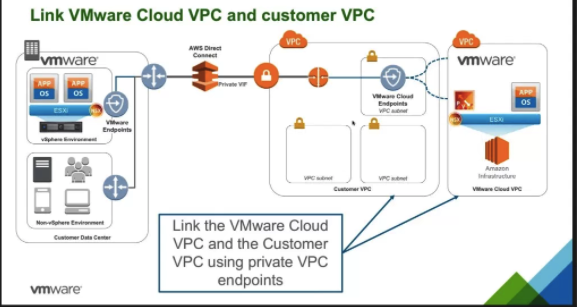 For extending the VMware Cloud on AWS environment to our on-premises infrastructure we need to deploy a stand alone NSX edge gateway appliance and create/assigned AWS Customer account which will work with VMware Cloud VPC also establish a private VPN connection from our on premises to our AWS VPC i.e Customer VPC and finally link both the on-premises and AWS vCenter Server together. Applications can take the advantage of entire AWS features compute, storage, database, analytics, mobile, and IoT. Because our VMware applications will be running in the same data centers as the AWS services, we’ll be able to benefit from fast, low-latency connectivity when you use these services to enhance or extend your applications. When extending the on-premises infrastructure to VMware cloud on AWS it’s not mandatory to have NSX license for on-premises which means we would be able to cold migrate the Virtual Machines, however if NSX license is available we would be able to perform live vMotion Migrations. VMware Cloud on AWS is a great move when it comes to achieve elastic scalability as that’s one of the most important thing we consider when working towards the goals of meeting the current and future demands, instead of the going through the long procedure of procuring the hardware we would be able to get all the benefits of on-demand access to the resources because of the underlying platform is AWS. Kanishk Sethi is a guest blogger for Vembu. He is a VMware vExpert, NVIDIA GRID COMMUNITY ADVISOR and owner of his popular virtualization blog Let's Virtualize who possesses overall experience of more than 6 Years working with virtualization and cloud technologies (VMware,Microsoft,Amazon). 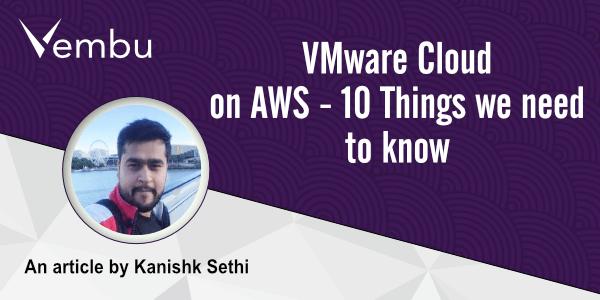 He is also a VMware Certified Instructor and conducts training for technologies like vSphere, vCloud, vRealize Automation,Disaster Recovery for VMware customers across the globe.